This is the last post for the year and I end it with 江南麵 (Kong Nam Mee). I am guessing that this noodle originated from 江南 (Kong Nam / Jiang Nan) hence its name. To everyone, thank you for writing comments on my blog for this year. I truly appreciate it and look forward to reading your comments. 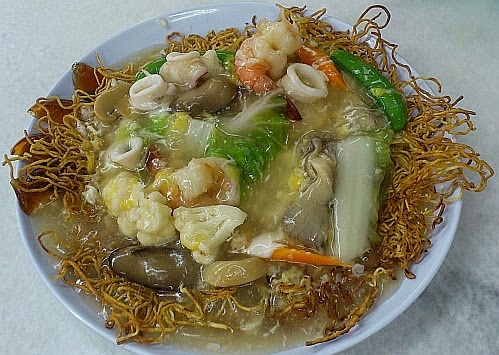 MYR10 for 1 pax with lots of mushrooms, vegetables, prawns, squid and half a century egg on top of deep fried noodle. Am awake, G just drank milk.. Looks like kongfu chau, I love anything with starchy eggy gravy.. Blog as you like, your sukak! Happy new year to you & family..
TQ. Same to you. So you gotta wake up very often at night? I love this!!! Used to eat the one at PJ Old Town. Didn't know the name - always refer to it as Cantonese fried. You mean you order Cantonese fried and they give you this? hmmm, the name doesn't necessarily suggests its origin.. just like Singapore Fried Beehoon (sing chow mai) is not from Singapore, haha!! great that you have achieve your one-day-a-post goal!! well done, I have tried to do that and yes, it's really no joke!! that's why I have now slowed down a lot, muahaha!! TQ. Same to you! So where is sing chow mai origins? The noodle looks good and I like the crispy bits. Happy New Year! TQ. Same to you! I like to soak the noodle until it is soft. Yummy food to end the year!! Happy New Year to you & your family. May you have abundance of good health in the coming year. Looking forward to more delicious food posts from you. TQ. Any countdown celebration for you? Happy New Year to you. Not really taking a rest but slowing the pace. Wow that's a big plate!! This resembles Cantonese fried noodles in every way except for the use of crispy thin noodles (which is not meehoon but those thinner than yee mee). Writing one post a day is "mission impossible" for me coz mine are so lengthy...but great that you kept up with your goal of one post a day! So, it's Happy 1st Year Blog Anniversary to you too!! TQ. Same to you! You write very good reviews so must be long. Wow, looks good with lots of ingredients. Happy New Year to you. Will be here as and when you are ready to post. I love this noodle! Crispy noodle with the egg gravy. Like Cantonese noodle. Happy new year to you, Mun. Thanks for your support and comments in my blog too. Cheers! If you are curious, maybe try it one day. Happy New Year! Happy New Year to you and your family! Good to see you back blogging.